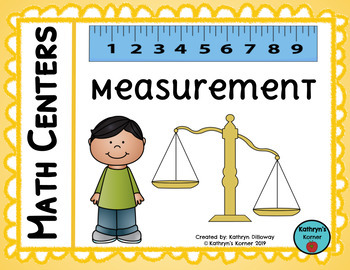 Supplement your measurement math unit with this set of fun and engaging measurement math centers. This file contains 4 different math centers that cover concepts of length, height, weight, and capacity. 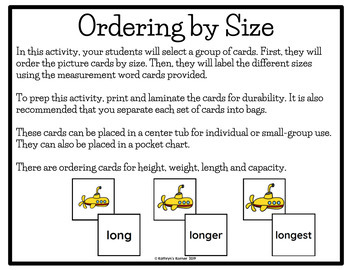 Each activity will help your students practice ordering by size, measurement reasoning and vocabulary. 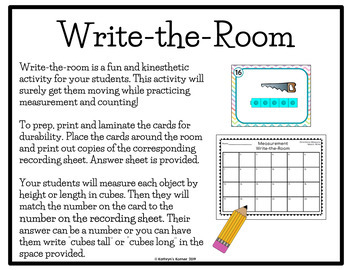 This pack of math centers contains a variety of activities that will keep your kids engaged while they practice essential measurement skills. 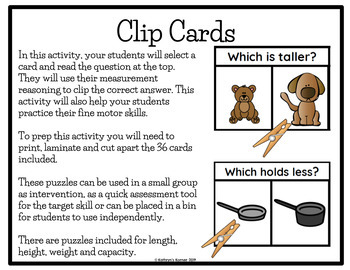 Each center activity can be used in a whole-group, small-group or independent setting. You can place each activity in a morning tub, center tub or in a pocket chart. Each activity is easy to prep. It is recommended that you laminate the activities for durability and continued use year after year. For easy organizing, place each activity into separate bags. Please click the Preview button for the full contents of this resource. Looking for Numbers to 10 math centers? Looking for Numbers to 20 math centers? Looking for 2D & 3D Shape math centers? Your feedback is important to me! Please take the time to write a comment and earn TPT credits!